A True Story About the Revolutionary Politics of Telling the Truth About Truth as Edited by Someone Who is Not Julian Assange in Any Literal Sense. It’s a moment of change. It’s a moment for people to meet in darkened rooms and whisper dangerous ideas. 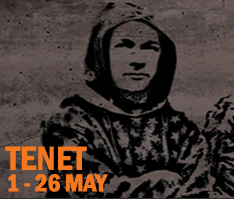 TENET brings together two of Europe’s most notorious radicals – the 19th Century mathematician Evariste Galois and the 21st Century’s very own Wikileaks founder, Julian Assange – in a witty, surprising show about about thinking outside the box, radical politics, maths, tea and biscuits. Come and join us. Dear all, I am proud to announce that my work as been selected to represent the UK with another 30 very talented British Designers and will be exhibited at the V&A (Victoria & Albert Museum in London) from 17 March 2012 – 30 September 2012. I am designing a children story at the Unicorn, directed by Matthew Lenton (artistic Director of Vanishing Point).